Packing for a vacation or a trip these days is a bit of a challenge. Whether you are flying or driving – space is always tight. And with the extra fees that airlines charge for baggage – if you can travel light, it's better. For the past few years – my family has skipped the baggage carousel and traveled using carry-on bags exclusively. If you choose the right luggage and pack sparingly and strategically, you too can enjoy the benefits of less stuff to bog you down on your next vacation. I wish that there was one “right” bag for every situation. But there is not. It may be tempting to get the biggest carry-on suitcase that still meets the size requirements of your airline, but if your plane is small or you are going to be the last to board you may need to be a bit more creative. 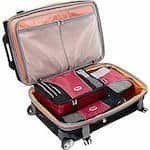 Your best bet is to choose a lightweight piece of luggage that will fit in an overhead bin but is also sturdy enough to be checked-in if need be. 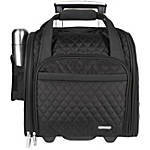 I really like this Travelon wheeled carry-on luggage that fits under airplane seat in front of you. This way you know your bag will be able to go on the plane with you no matter what. It even includes a packable tote, in case you pick up a few more souvenirs than you planned. Here are some more ideas for choosing the right luggage for your next trip. What will you be doing when you arrive at your destination? Recently we went on a short beach vacation. Because we were only gone for a few days – I was able to pack everything that I needed into a large tote bag like this one from Vera Bradley. When we got to the hotel, I unpacked the tote bag. Then I filled it up with a beach towel, water bottle, sunscreen, and a good book – and headed off to the beach. If you throw all your stuff into one suitcase, you just create a big mess. I like to use eBags packing cubes to compartmentalize my things. While on vacation, I collect all my dirty clothes in an empty packing cube. So, when I get home unpacking and laundry become very easy. A little coordination goes a long way. If you can mix and match your clothing, you can create many outfits out of just a few pieces. This is especially important when it comes to bulkier items like jackets and shoes. Choose a neutral overcoat that you can dress up or down. And pick some comfortable shoes that you can wear for walking but also out for dinner. (It's definitely a challenge but a pair of sandals like these can do the trick). Along the same lines as mix n' match is the concept of wearing it twice. While you should pack a fresh pair of undergarments for each day ;-), you don't necessarily need a fresh shirt or pants for each day that you plan to be away. your own body – do you sweat a lot? etc. Packing neutral items that you can dress up or down, again, is key. I always pack a pair of black leggings like these. They go with anything and take next to no room in my luggage. The worst packing mistake is just taking your clothes along for the ride. Remember, the time to decide what you will wear is before you leave. Don't fall victim to the “I might need this or I might need that” syndrome. Be honest with yourself about what you really will wear when you are away and take only those items. As a travel rule of thumb – pack your lightweight items and wear your heavier items. No matter how hard you try, it seems like shoes always want to foil your plans to travel light. I always wear my jacket or a sweater on the plane. This is perfect because jackets and sweaters are bulky. And planes and airports can be cold. I also wear my sneakers whenever I travel. No, I won't make fashionista of the year. But I will be comfortable, especially if I have to sprint across an airport to make a connection. Ok – I get it. Sometimes you just need to take big things. But you can still travel light if you ship them ahead of time. For a golfing vacation – you might need some golf clubs. Skiing? Same thing. I am not a golfer – so I can't tell what is most economical. But this article has a lot of good information and tips to consider on shipping golf clubs via FedEx. Check with the place you will be staying at your destination to see if they can accept and hold incoming packages for you. If you will be traveling for an extended period of time, you may want to consider doing laundry at your destination. 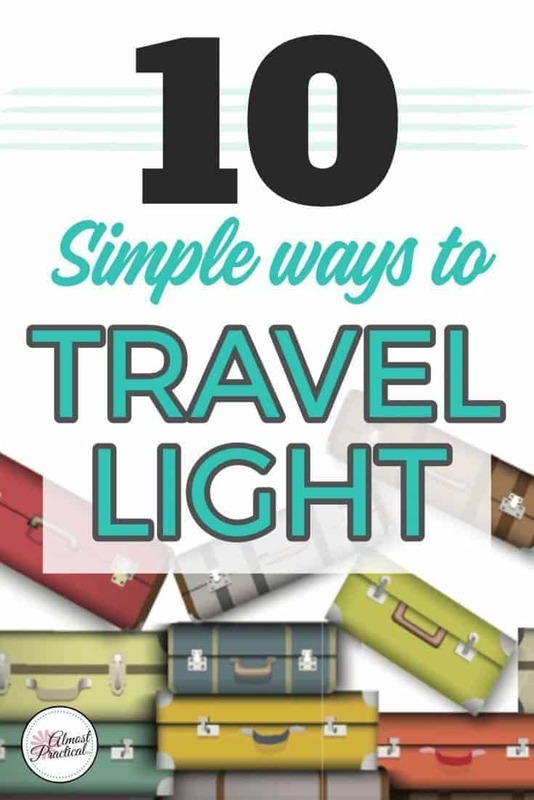 This way you can still take less clothing and travel light. This travel size package of Tide Pods makes it easy to pack laundry detergent – and the package says that it meets airline carry-on guidelines. On one beach vacation, we actually did laundry right before we left. We brought back suitcases full of clean clothing that went right into our drawers at home. Need large quantities of sunscreen or shampoo? Consider buying them at your destination instead of lugging them from home. Or use travel size items. The downside to travel size toiletries is that they often cost as much as full size items. But you can buy reusable travel size bottles that you can fill yourself. Remember – the more efficiently you pack, the more enjoyable your trip. View all of our travel articles here. Great tips to stress-free packing! Packing right makes the vacation experience so much better! So true. I hate to overpack – but underpacking isn’t much fun either. You have to get it just right! Great tips! I recently went on a 10 day trip to Europe and wanted to pack as light as I could. I had seen one of your posts about the eBags packing cubes and they made my packing so easy and organized. Wearing your big shoes instead of packing them and wearing items twice also helped me pack light. So glad that the packing cubes article helped with your travels. They really are useful. Thank you so much for stopping in and letting me know!